House Assistant Minority Leader James Clyburn (D-S.C.) served as CUNAs VIP guest when the trade association unveiled its Democratic National Convention leave behind project Sept. 5 during a ribbon-cutting celebration. 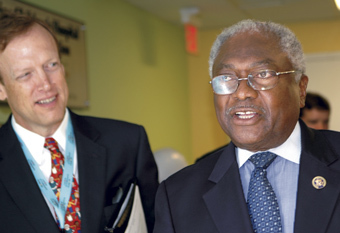 CUNA President/CEO Bill Cheney (left) welcomes Democratic leader Rep. James Clyburn (D-S.C.) as he arrives at Levine Children’s Hospital to celebrate the grand opening of the rooftop play area. House Assistant Minority Leader James Clyburn (D-S.C.) served as CUNA’s VIP guest when the trade association unveiled its Democratic National Convention leave behind project Sept. 5 during a ribbon-cutting celebration. The project converted an existing rooftop space on Levine Children’s Hospital’s 12th floor into a outdoor play space, adding a deck and pavilion, outdoor play equipment and environmental improvements.